Battle Youth Ultra-Stick football gloves are the newest and most advanced addition to the Battle line. These receiver football gloves are made using Battle’s blad-span technology which allows for increased flexibility and range of motion for optimal performance. 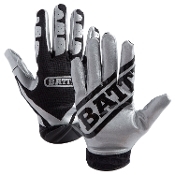 The real separator between Battle football gloves and the rest is the Ultra-Stick material on the palms. This is the highest quality tackified material in the industry and will allow you to catch any pass on the field.